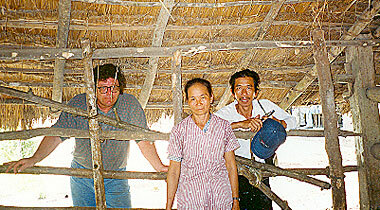 Mike and Do visit Binh An, a village where MQI estalished a loan fund many years ago. The first photo shows the Women's Union taking care to make sure that the correct women are receiving their loans. 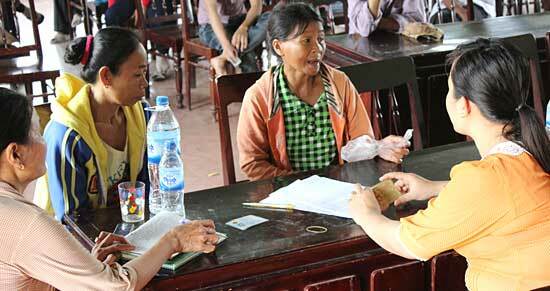 The second photo shows the group of women who are happy to be receiving their loan from the Binh An Women's Union. Madison Quakers, Inc. began its series of micro-credit projects with the funding of the My Lai Loan Fund in January, 1994. Based on the Grameen Bank concept the micro-credit projects funded by MQI provide loans to poor women, many of them widows, for the purpose of starting small businesses. Depending on whether the village is located along the coast or in the mountains, these loans are used for buying and selling fish, purchasing a small boat, retail business, raising cows or raising pigs. The loan periods are two to three years with low monthly interest rates. These interest rates help defray the administrative costs of the project. At the end of the loan cycle when the loans are repaid a new cycle begins with a new group of women. MQI’s partner for these micro-credit projects is the Women’s Union of Quang Ngai province. The Women’s Union chooses the women to receive the loans and administers the projects. They also work with MQI Project Coordinator Mr. Phan Van Do to visit each village MQI has funded to monitor and help resolve any problems that might arise. In addition to these responsibilities the Women’s Union organizes regular meetings with the recipients of the loans to hold discussions on animal husbandry and small business management. Supplementing these discussions are training sessions on health care and family planning. Micro-loan recipients are chosen by the Women's Union. On each return trip provincial Women’s Union leaders introduce MQI members to village leaders interested in starting revolving loan funds in their villages, and the number of loan funds we begin is dwarfed by the number of village leaders interested in giving these opportunities to the women of their village. 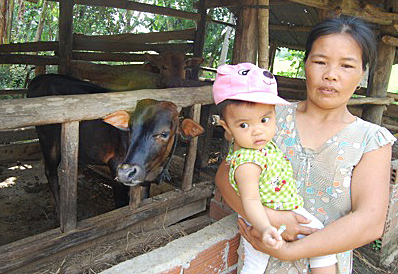 This woman now has a calf, given by the cow she was able to buy with her loan. 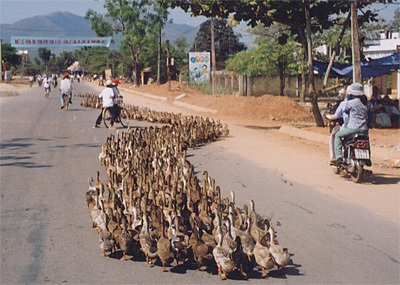 Raising ducks is one business Vietnamese women use their loans for. One of the major uses of the micro-credit loans is to set up business as a "fishmonger", buying from the local fishermen, and reselling the fish at the markets. 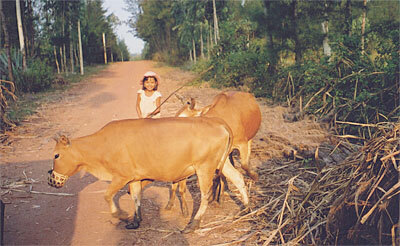 Tending to the cows is a responsibility of many family members. 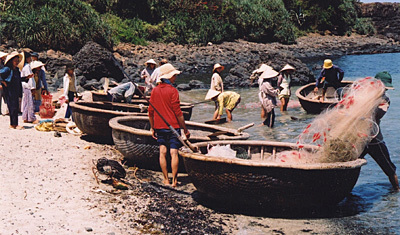 In the year 2000 we established a loan fund in Truong Khanh village. Whenever we fund a new project like this our project coordinator, Mr. Phan Van Do, and I return to the village to meet with some of the women who have received loans. 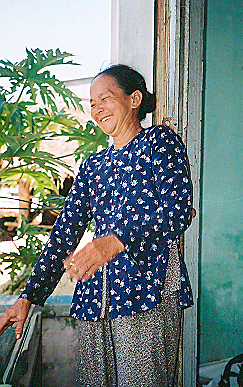 One of the women we met that year was Mrs. Pham Thi Huong. She took us to her cow pen to show us the cow she had bought with her loan. She told us she had already had the cow artificially inseminated so when the calf was born and weaned she could sell the calf and repay the loan. She could then keep inseminating the cow to build up a herd and would then have a sustainable business. Do had told me the night before we visited Truong Khanh village that in April, 1969, this village had also suffered a massacre by American soldiers. When Mrs. Huong finished telling us about her cow Do asked her about the massacre. I watched as she talked to Do about the massacre and then she began sobbing and couldn’t finish. She said she had survived the massacre but her aunt and two children were killed. The massacre at My Lai took place over a period of only four hours. The massacre at Truong Khanh took place over a period of two days. The American soldiers kept returning to shoot anyone they saw but were mostly concerned about hiding the evidence of the massacre. So they burned and partially buried the bodies. It was days before the villagers felt safe enough to come out of hiding to unearth the bodies to bury them properly. Bodies rot quickly in tropical heat. The last thing Mrs. Huong said to us before she broke down was “I cannot forget the smell of the decomposing bodies of my children”. As Do and I stood with her in front of the mud hovel she was living in it seemed to me she had died along with her children. She was walking and talking but dead inside. And understandably so, because what mother could live with that memory. But I was wrong. Two years later Do and I returned to Truong Khanh to again visit with some of the women who had received loans two year before. Mrs. Huong and Mrs. Du, Chair or the Truong Khanh village Women’s Union, were eagerly awaiting us on a motorcycle outside the village. They enthusiastically led us around the village showing us the improvement in the lives of the women over the previous two years. Mrs. Huong was a different woman. She was talking and laughing and her eyes were bright and shiny and alive. Do asked the neighbors what had happened to cause such a dramatic change in her and they said that once she was able to sell calves from her cow that at long last the crushing burden of poverty she had been living under had lifted enough so that she could begin to heal. Over the years I have seen this kind of dramatic change in the lives of women who have received loans. What this has shown me is that these loans to poor women offer more than economic aid, they also provide what can only be termed spiritual aid.